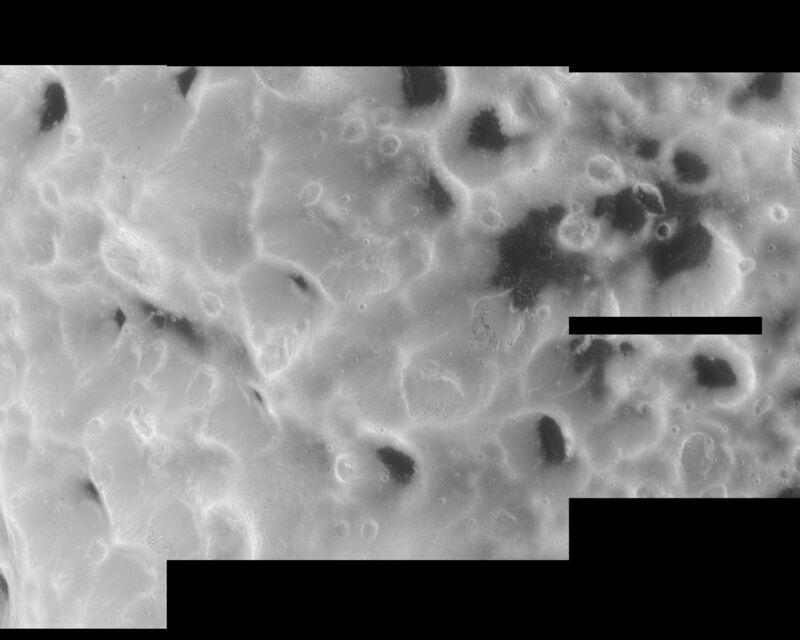 This high-resolution Cassini mosaic shows that Hyperion truly has a surface different from any other in the Saturn system. 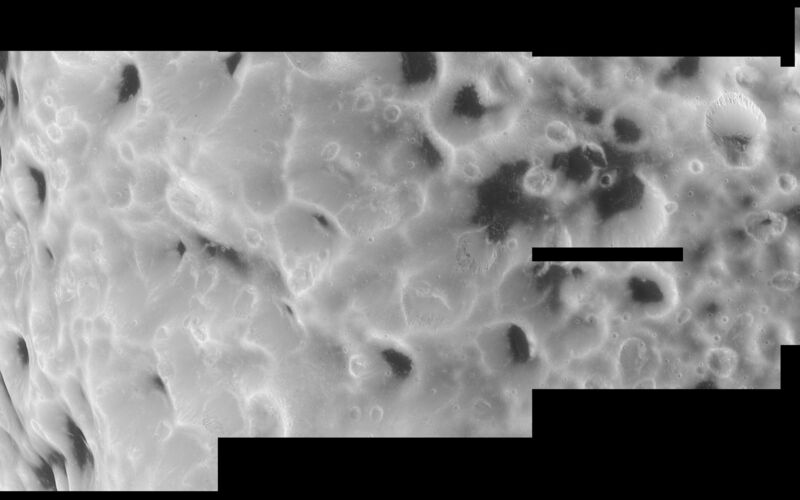 The mosaic is composed of five clear filter images taken during Cassini's close flyby of Hyperion on Sept. 26, 2005. The spacecraft passed approximately 500 kilometers (310 miles) above the moon's surface. Hyperion is 266 kilometers (165 miles) in diameter. Scientists are extremely curious to learn what the dark material is that fills many craters on this oddball moon. Features within the dark terrain, including a 200-meter-wide (650-foot) impact crater surrounded by rays to the right of center and numerous bright-rimmed craters, indicate that the dark material may be only tens of meters (hundreds of feet) thick with brighter material beneath. Scientists will also be examining Cassini's sharp views to try to determine whether there have been multiple episodes of landslides on Hyperion. Such "downslope" movement is evident in the filling of craters with debris and the near elimination of many craters along the steeper slopes. Answers to these questions may help solve the mystery of why this object has evolved different surface forms from other moons of Saturn. 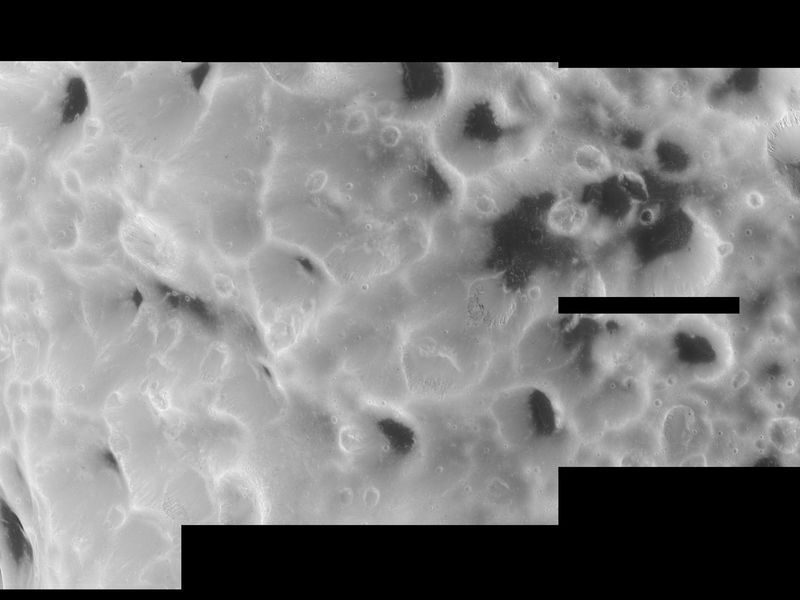 The images comprising this mosaic were taken with the Cassini spacecraft narrow-angle camera at distances ranging from approximately 8,500 kilometers (5,300 miles) to 4,600 kilometers (2,900 miles) from Hyperion. Image scale is 26 meters (85 feet) per pixel. The Cassini-Huygens mission is a cooperative project of NASA, the European Space Agency and the Italian Space Agency. The Jet Propulsion Laboratory, a division of the California Institute of Technology in Pasadena, manages the mission for NASA's Science Mission Directorate, Washington, D.C. The Cassini orbiter and its two onboard cameras were designed, developed and assembled at JPL. The imaging operations center is based at the Space Science Institute in Boulder, Colo.